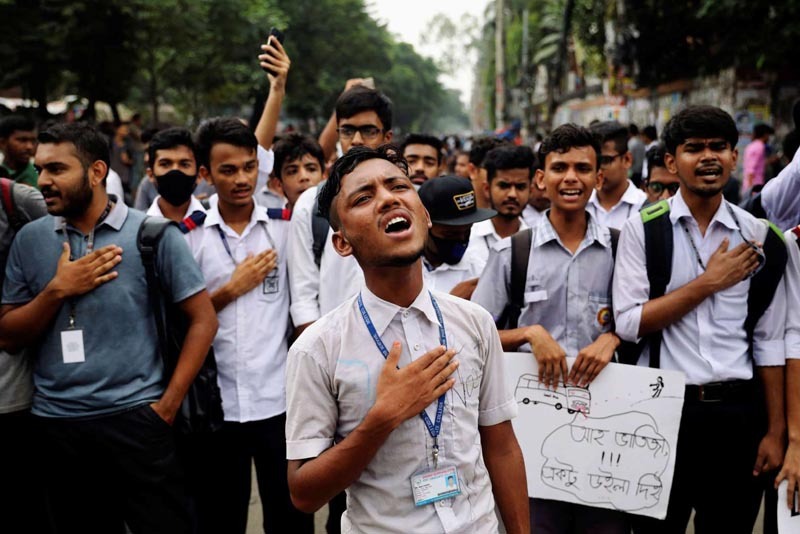 Students sing the national anthem as they take part in a protest over recent traffic accidents that killed a boy and a girl, in Dhaka, Bangladesh, August 4, 2018. Bangladesh police on Sunday launched a crackdown on dangerous driving as the government tries to quell student unrest sparked by the death of two teenagers who were mowed down by a speeding bus a week ago. Tens of thousands of students have protested since last Sunday when a privately run bus hit and killed the college students, alarming the government ahead of a general election this year. "Our police force has started a week-long drive to bring discipline on the roads," Prime Minister Sheikh Hasina said at an event in Dhaka on Sunday. [post_ads]Spontaneous student protests are rare in Bangladesh and Hasina suggested her political rivals were using the issue to stir up anti-government sentiment. The opposition Bangladesh Nationalist Party denied any involvement in the protests. Separately, the U.S. embassy said in a statement outgoing envoy Marcia Bernicat's vehicle was attacked by armed men, some on motorcycles, in Dhaka on Saturday. "The ambassador and her security team departed the area unharmed ... however, two security vehicles sustained some damage," it said in the statement issued on Sunday. The protests spreading across Bangladesh have highlighted traffic risks in the densely populated country, where more than 4,000 people die in road accidents each year, one of the world's highest rates, the World Bank says.